When you move to a new neighborhood (or even if you’re just passing through), it can feel like your whole routine is turned on its head. That’s even more true in a city like New York, where the sheer number of options is bound to give even the most decisive person choice paralysis. But fear not, because we’ve broken down nearly everything you could need when you come to the Lower East Side -- from where to get your pants hemmed to where to find a $3 dinner (and trust us, that’s going to come in handy). Sure, all the big-name museums are uptown -- but so are all the tourists. In the LES, you don’t have to travel north of Houston to take in some of the most celebrated art in the world. 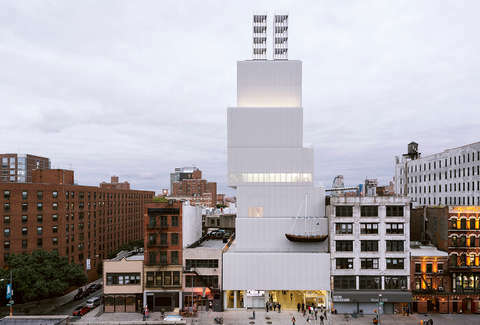 The New Museum has been a neighborhood staple for over 40 years, and it’s Manhattan’s only museum dedicated to contemporary artists. Its founding director, Marcia Tucker, was working as a curator at The Whitney when she realized new work from living artists was difficult for the public to see at traditional museums -- so she started her own. There are only a few permanent works displayed. Instead, the New Museum highlights an ever-changing roster of exhibitions, from artists like Thomas Bayrle, whose work focuses on the effects of the digital world, to Marianna Simnett, a young film and sound artist from the UK marking her first solo institutional exhibition in the US. Make plans to go on a Thursday night, when you can “pay what you wish” for entry. Few people work as hard as New Yorkers, who low-key compete with each other about how late they stay up answering emails. So when it comes time to de-stress after one of those particularly draining days, you need a place you can get to practically on autopilot. 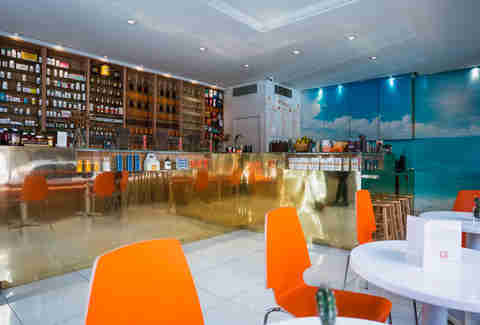 Such a bar should supply cheap drinks, yes, but also feel homey enough that you can actually unwind. Enter Bonnie Vee. With $5 Narragansett, $2 off every glass of wine on the menu, and a discounted slushie during their three-hour happy hour, Monday to Friday, you’ll be set no matter what you feel like drinking. The deals go late enough -- until 8pm -- that you can still cash in on a happy-hour priced drink even if you get stuck at the office. Plus, the bar is comfy enough to feel like your second (or, let’s be honest, in this neighborhood, only) living room, thanks to plenty of seating, including a backyard garden -- perfect for thawing out from overly air-conditioned offices in the warmer months. We all know the feeling: It’s mid-August, you’ve spent the past four weekends subsisting on hamburgers and pasta salad at backyard barbecues, and your high school reunion is next month. ConBody is for that. The intense workout series was created by Coss Marte, an ex-con who lost 70 pounds in six months during his four-year prison sentence by performing military boot camp exercises in his 9x6 cell. ConBody’s Bowery studio holds classes daily, and Marte leads several throughout the week. He’s also made it a personal mission to hire formerly incarcerated individuals as instructors, in an effort to teach the public about prison reform… while getting you in the best shape of your life. When the parents come to town, you need a place that says, “I’m doing just fine, see? !” but isn’t so convincing that you’ll be calling home in two weeks to have them pitch in for rent. The Fat Radish is the perfect medium: It has trendy, modern decor with enough rustic farmhouse touches to make mom comfortable. The menu is full of elevated takes on approachable dishes, like Thai green curry, a bacon cheeseburger, and beef sirloin. (With some vegetarian options, too.) The best part? It’s all under $30 a plate -- so you’ll have no problem picking up the check. 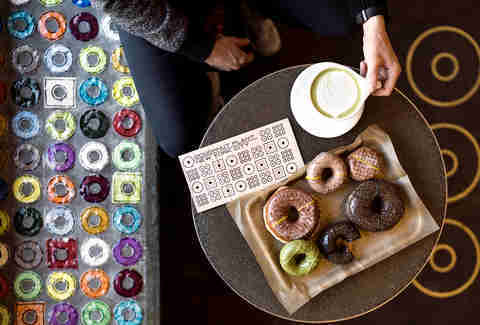 Doughnut Plant is like the OG of the artisanal donut trend, having gotten its start in the basement of a LES tenement building in 1994. It wasn’t until 2000 that the bakery opened its first official storefront, on Grand Street, in the same neighborhood. In its 20-plus years of donut mastery, the Plant’s become a New York staple, and offers flavors from matcha green tea to Brooklyn Blackout. 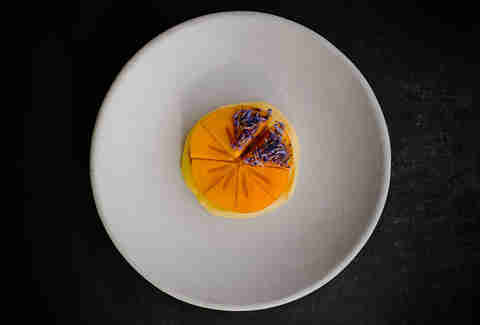 The bakery even pioneered a new way to make jelly doughnuts so that their handmade jelly is in (literally) every bite. Plus, they make everything by hand daily without eggs, artificial ingredients, or preservatives. So feel free to try every flavor, at least once. Hey, you were in the neighborhood, right? You don’t realize you need a go-to tailor until it’s three days before your friend’s wedding and you remember that you haven’t gotten your pants hemmed yet. And finding a decent tailor in the city that won’t up-charge you for a rush job can be nearly as impossible as getting to Staten Island via the subway. Enter Orchard Express, an old neighborhood standby where seamsters can do quick repairs (like replacing a button or hemming a skirt) in under 10 minutes. Need a jacket altered? Give them an hour. 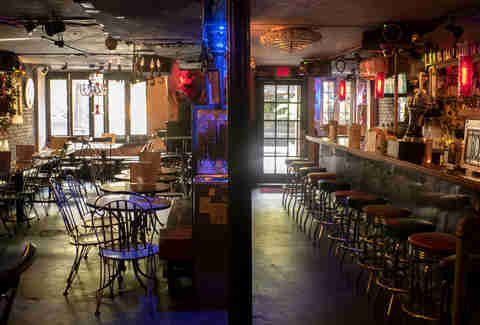 Kill time by examining the kitschy, sports-themed decor, or heading to one of the bars on the block (like Max Fish or Lucky Jack’s). And don’t worry about splurging on a cocktail: A hemming at Orchard Express will run you just $5. 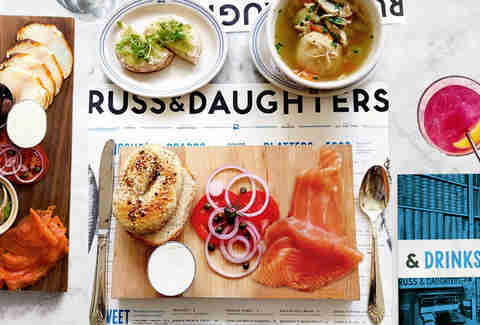 Few food items are as quintessential to New York’s food scene as the bagel, and that’s thanks to places like Russ & Daughters. It was one of the city’s first “appetizing shops,” opening in 1914, and is one of the only remaining shops of its kind on the LES. Appetizing is a Jewish food tradition, and unlike delis, which sell cured and pickled meats, appetizing stores sell fish and dairy products (like cream cheese and lox). In addition to the century-old shop on Houston Street, there's also a sit-down cafe on Orchard Street run by the fourth-generation Russ family. The cafe serves the same expertly-sliced salmon and toasty bagels, along with cocktails and egg creams, in a soda fountain atmosphere. Whichever location you choose, come in, order the classic bagel & lox sandwich (or matzo ball soup, or rugelach), and taste a bit of history. Sometimes, you need to escape -- without leaving your ’hood. This community garden feels miles away from the city, thanks to a spacious garden, pond, and even free-roaming chickens on the property. It may be one of the best-kept outdoor secrets of the LES, as the garden is only open to the public from 12-4pm on weekends and 5-7pm Thursday evenings -- but you might catch the gates open whenever they can snag two volunteers to work. While there, play a round of bocce, or set up shop on a bench and dive into a book. After an hour or so, you’ll be ready to face the hustle and bustle again. Celebrating at a “nice” restaurant in Manhattan can easily run you a small fortune, especially if a tasting menu is involved. Not at Contra. The Michelin-starred restaurant has been heavily praised as one of the best in the city since opening in 2014, which sounds like it should seriously set you back on next month’s rent. 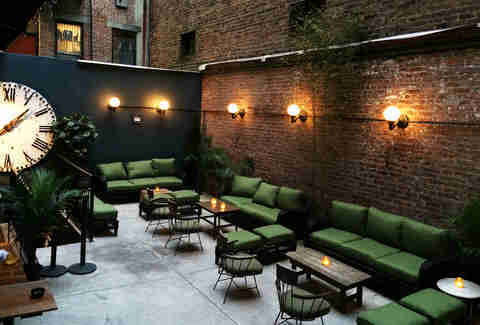 But the tasting menu here is actually one of the most affordable in NYC, at just $78 per person for seven courses. (Add a wine pairing for an additional $60, if you feel like splurging.) 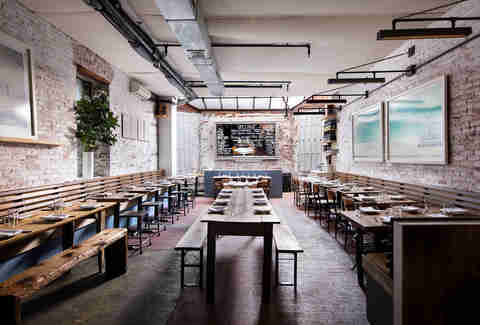 Chefs Fabian Von Hauske and Jeremiah Stone’s dishes are whimsical, while the wine list is full of funky, natural wines -- so this won’t be an ordinary celebration. If you can’t get a reservation (the space is on the small side), try the eight-seat bar, which serves a three-course menu, or head over to sister restaurant Wildair (also in the neighborhood). Finding a place to live in this city is something to celebrate (hello, crazy competitive rental market) and turning those bare, undersized dwellings into a home takes a truly loving touch -- and a handful of unique gifts from your closest friends. When you need to supply one of those, head to Coming Soon. Founded by two designers, the shop is part furniture store, part gift shop, and stocks everything from funky mid-century modern chairs to vases, dishes, teapots, charcoal eye masks, and incense. Even the simplest objects look like pieces of art, so you can rest assured your gift will stand out among the run-of-the-mill candles and bottles of wine at your pal’s housewarming party. This bar manages to take all the beloved and tacky elements of a dive bar (leopard print pool tables, cheap drinks, pickle martinis) and somehow combines them to create an NYC institution. Open since 1916, 169 Bar has been fueling New Yorkers’ Friday nights for more than a century and bills itself as “one of the last original bars in Manhattan.” Since taking over the establishment in 2006, New Orleans native Charles Hanson has put his own Big Easy spin on the place, so there’s always live jazz and po' boys on the menu. That atmosphere, combined with $3 beer-and-shot combos from 12pm to 7:30pm, makes 169 Bar the ideal spot for your crew on a Friday night. There is going to come a point in your Lower East Side existence where you are going to be 1) nearly broke and 2) absolutely starving. And while, technically, Lam Zhou is a block outside the “traditional” LES neighborhood bounds, it’s worth the (incredibly short) walk. Though their name suggests noodles are the go-to item, the dumplings are a sleeper hit, and frequently named one of the best in the city. At the low, low price of $3 for 11 of their classic pork & chive dumplings, you’ll leave here full, content, and still able to pay for your Netflix subscription. You’ll even get some entertainment with dinner, too, as kitchen staff hand-pull their namesake noodles while you nosh. Just remember it’s cash-only, so round up those couch quarters. Stanley’s is part pharmacy, yes, but it’s also reminiscent of an old-school soda fountain -- except that everything they’re serving is good for you. Stanley George, the pharmacist behind the business, opened what he calls the world’s first “wellness bar & pharmaceutical practice” in 2013, where they mix specialty teas and tonics for a plethora of ailments. Be it an upset stomach (there’s the ginger-tumeric shot or a tonic of homemade ginger ale, citrus bitters, and fresh ginger juice) or a hangover (their Detox Rx tea is made with tulsi and mint to help the body get rid of toxins), there’s a potion here to help cure what ails ya. If it’s more everyday wellness you’re after, they have kombucha on tap and plenty of morning pick-me-ups for grogginess. George even opens at 10am on weekends so he can mix up remedies for brunch-goers recovering from a late night. When it’s blistering hot in New York, all you’re going to be thinking about is getting out of this overheated concrete jungle. Because that’s not always feasible, you’re going to need a go-to city pool. Thankfully, the Olympic-sized swimming pool at Hamilton Fish Recreation Center is massive enough to accommodate about half of Manhattan’s population comfortably (OK, it’s not that big, but you get the point), and it’s free. It’s open until 7pm daily, but be sure to bring a lock for your change of clothes, as only plain white t-shirts are allowed to be worn onto the pool deck over your suit. Forgot the sunscreen? No worries, SPF50 is offered for free here, too -- and trust us, you should use it. There’s nothing like being in a crowded subway train with a sunburn.